Lesser celandine—for some, a Bitter Buttercup! | Gardens Alive! Luckily, Round-Up is not approved for use near water, and I doubt anyone would invite Federal prosecution by writing you that big grant check. And hundreds of acres?! 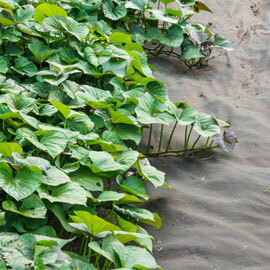 Removal of such a large number of plants along a river bank in any manner would lead to severe environmental devastation. And for what? To be able to risk replacing a plant that produces pretty yellow buttercup-like flowers and does a magnificent job of preventing erosion with different plants that thrived in a different era and may no longer have what it takes to compete in a world that's been dramatically changed by the presence of humans? Nature doesn't favor natives—or so called 'invaders'. Nature simply provides a canvas, and the rules of Darwin decide the winners. It's not the same river as when those other plants first flourished; human activity has changed everything about it and the area around it. The best I can suggest is that you establish a nearby area that you can protect with deep edging in which to show off your natives. Any attempts to remove that much celandine will be expensive, time-consuming, immensely destructive to the environment, and run a high risk of failure. BUT you might be able to get it out of some small areas to help establish that refuge without causing too much damage. There is a new class of alternative broadleaf herbicide that uses Iron as its active ingredient—and it's specifically labeled for use on this plant (although the label just calls it "creeping buttercup", they clearly mean lesser celandine). Just go slowly, and try and keep it away from that priceless waterway as much as possible, as all herbicides must contain some type of surfactant or they won't work. And smothering the plants with wood ashes is an ancient tactic I found suggested in the lesser celandine article at a wonderful "Modern Herbal" website, www.botanical.com. This might be another nice experiment for a small area. But please don't mess with any right near the river; lesser celandine is virtually invulnerable in wet areas, and the erosion you'd cause trying to get it out would be immense. First, test the lawn's soil; if the pH is low, add wood ashes to raise it to neutral and go heavy on the ashes overtop of the lesser celandine. By all means, try an iron-based herbicide as well. Then cover any bare ground in the flower beds well with shredded leaves or other non-wood mulch and install deep edging to keep the celandine out. And again, don't overwater! Throughout March and April, this cheerful little plant is in full bloom, but as the spring passes into summer, the flowers pale somewhat, and the whole plant looks rather sickly, the warmth of the lengthening days withdrawing from it the needed moisture. By the end of May, no flowers are to be seen, and all the plant above ground withers and dies, the virtue being stored up in the fibres of the root, which swell into the form of tubers. If the plant is dug up, late in the summer or autumn, these tubers are seen hanging in a bunch, a dozen or more together, looking like figs, hence the plant's specific Latin name ficaria, from ficus (a fig). By these tubers, the plant is increased, as they break off readily, each tuber, like a potato, producing a new plant. To eradicate this plant from any ground, it is necessary to remove the roots bodily, for if the plants are dug into the soil, they work their way up to the surface again, the stems branching as they grow upward from the tubers, and at every branch producing fresh tubers.